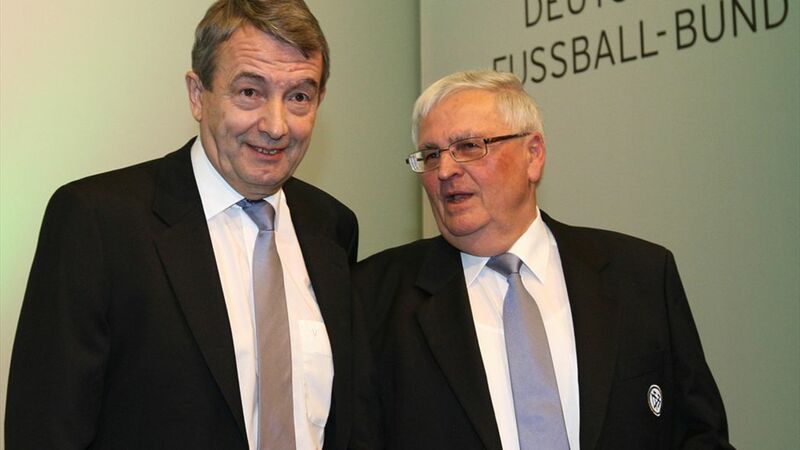 October 16 – Two ex-presidents of the German FA, Wolfgang Niersbach (pictured left) and Theo Zwanziger (pictured right), plus former general secretary Horst Schmidt have won a landmark legal case after a Frankfurt court rejected tax evasion charges against them saying there was insufficient evidence of wrongdoing. In May prosecutors filed charges against Niersbach, Zwanziger and Schmidt accusing them of having deliberately deceived tax authorities and having filed a false tax returns on behalf of the DFB in 2006. But the regional court decided it had “not seen enough suspicion of wrongdoing” to warrant a trial and proceedings were also ended in the case of Switzerland’s Urs Linsi, who for eight years was general secretary of FIFA. The case was linked to the highly complex 2006 World Cup cash-for-votes scandal with those charged accused of arranging for incorrect tax returns to be submitted to enable the DFB to avoid paying around €13.7 million in tax according to the Frankfurt prosecutor’s office. The tax return in question included a €6.7 million payment made by the DFB to the late Adidas chief executive Robert Louis-Dreyfus that has come under constant scrutiny over claims the money was used as a slush fund to buy votes for Germany to host the 2006 tournament. The payment had been declared as a contribution to a cultural event (and therefore tax-deductible) but the event never took place. Niersbach, who succeeded Zwanziger as DFB president, was banned from football for a year after the payment came to light. In what has been a complicated web of intrigue and suspicion, a year ago the tax office ordered the DFB to pay €19.2 million in back taxes related to the infamous payment. That came a year after a 361-page report commissioned by the DFB attempted to explain a trail of irregularities surrounding the World Cup bid. And several years before that, the same €6.7 million sum mysteriously ended up in the hands of now-disgraced former Asian confederation president Mohamed bin Hammam. The Prosecutor’s office has one week to appeal against the latest ruling which was welcomed by the current DFB leadership. “We see our legal opinion confirmed through this decision of the regional court in Frankfurt,” DFB President Reinhard Grindel said in a statement. Continually lurking in the background, however, is the fact that Swiss judicial authorities are conducting an inquiry of their own not only involving the officials cleared of tax evasion but also Germany’s most revered footballing figure Franz Beckenbauer who headed the country’s successful 2006 World Cup bid and has consistently denied any involvement in manipulating the ballot which was won by a single vote.